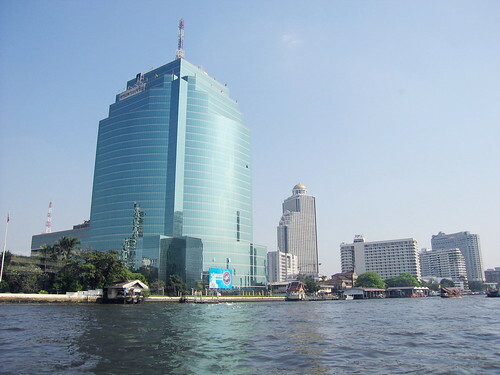 The Bangkok sightseeing blog has started, and today I want to share a very nice photo that shows the view from the Chao Phraya river in Bangkok. This is the most important waterway in Bangkok, and it runs right through the centre of Bangkok and separates it into two halfs – kind of like a broken heard if you look at it on a map. Some Thai’s believe this is an auspicious sign that the city is doomed one day – but for now, it is still a beautiful place to visit, and if you are not auspicious, there is probably nothing to worry about. What you see here is the C.A.T. Communications building. Bangkok features some beautiful modern architecture, and the government budgets are usually high enough to afford it. CAT is the state-owned communications company, their real company name is CAT Telecom Public Company Limited. Why the name CAT? Because it used to be known as the Communications Authority of Thailand. (No cat lovers there). In September 2010, this company attracted a lot of hate. The reason? Well, in Thailand 3G technology is still not fully developed and available – and one of the main reasons is that 3G licenses have not been auctioned yet. Every time there was an auction, CAT stepped in and prevented it from happening, essentially slowing down the complete digital development of Thailand. Why would they do such a thing? Because as of now, they benefit from this state and can make money from it, and obviously they have their own interests more in mind than that of the country. After the 2006 coup, the army made some changes in the CAT company (for example, preventing the privatization of this company and assigning Assistant Secretary-General General Saprang Kalayanamitr to become the new Chairman of the Board of Directors of CAT Telecom and TOT. Nonetheless – the building is an impressive construction right by the riverside. For more information, simply book one of our Bangkok sightseeing tours.